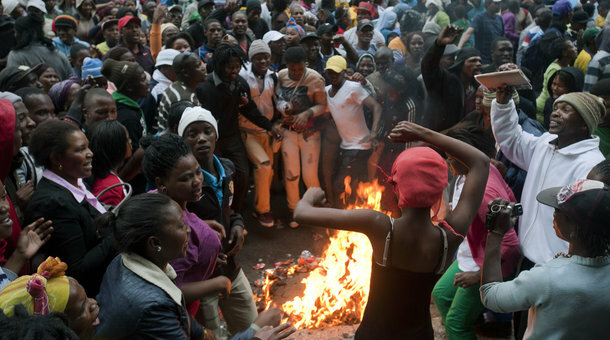 People taking part in a protest agaianst poor public services sing and dance around a rubbish fire on October 30, 2013, in the centre of Cape Town. The people congregated outside the Western Cape provincial Legislature, calling for Western Cape Premier(not visible) to come and address them. South Africa has declared ten days of official mourning for Nelson Mandela. As people reflect on his legacy, it’s important to remember that his struggle against apartheid was a fight against a system of political and economic oppression. When he was sworn in as president in 1994, justice and peace for all were at the top of his list of goals for South Africa. But in his next breath came an economic hope. “Let there be work, bread, water and salt for all,” he said. But the country has continued to struggle with economic inequality. The black middle class in South America has nearly doubled just in the last decade. For many South Africans, “work, bread, water and salt” are still hard to come by. The country has an unemployment rate of nearly 25 percent. For those who do find work, wages can be widely divergent. South Africa is one of the most unequal countries in the world in terms of income distribution, and the differences often fall along racial lines. As Bloomberg’s Mike Cohen points out, white households earn an average of six times more than black ones. And while nearly all white homes have modern plumbing, two thirds of black homes do not, notes Charles Kenny of the Center for Global Development. Katzin, who met Mandela several times over the course of her work in South Africa, says he made it clear that the task of undoing “economic apartheid” was something he might not see completed in his lifetime. “So much of it has been baked in to the infrastructure and the geography and the systems of the country,” Katzin says.